In the middle of winter four years ago, before he had planted a single seed, before he had finalized any plans for his new CSA, farmer John Crooke from Tinicum CSA called me to discuss his vision for creating a Community Supported Agricultural farm that would include a donation model that could benefit those living in his community who might not have the disposable income needed to access the delicious, nutritious food he and his farm partner, Stefan Streit, planned to grow. We talked openly and compassionately about just what a donation model for CSA shares might look like. We talked about the concept of “Food Inequality” and how our current food system has grown to provide only the cheapest, least nutrient-dense foods for people struggling financially. So many people living paycheck to paycheck have to make very tough financial choices. There’s the rent to cover, then utilities, transportation, medical, clothing, school expenses and then…money for food with whatever is left over. So you can understand how stretching family budgets to source shelf-stable, cheap processed food that will last the longest, fill hungry bellies and provide the greatest number of calories might be the logical choice. But there is another price they pay: a lack of healthy, nutritious food often leads to so many diet-related health issues that we now are seeing among the people coming to food pantries and soup kitchens looking for help. Diabetes is prevalent. So is high blood pressure. And then there is the mental and emotional toll that goes along with lack of nutrition, and it affects the whole family. Most people don’t realize that among food pantry recipients, more than 30 percent are children, and more than 12 percent are senior citizens. And even in fairly prosperous areas like Bucks County, PA and Hunterdon County, NJ hunger and food-insecurity do exist at an alarming rate. 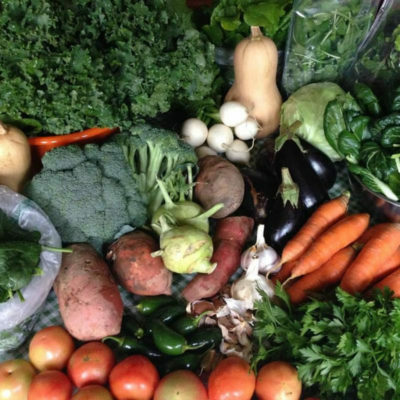 Tinicum CSA’s goal to identify families in need and share what they grow was even more admirable considering that they grow according to organic principles, use no pesticides or harmful sprays, and protect our fragile environment. 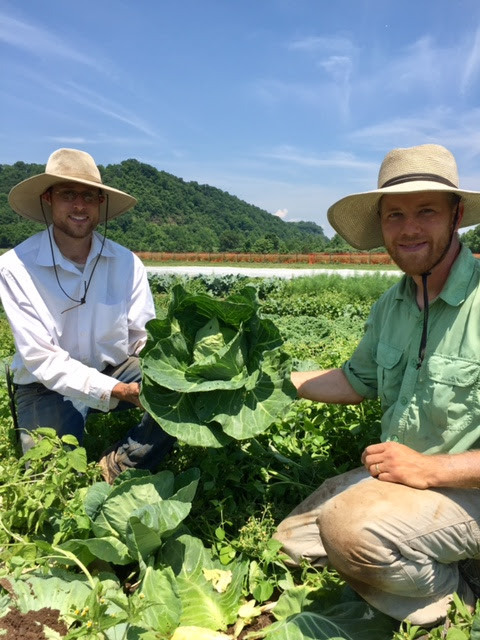 This process of farming is much more labor-intensive than conventional farming methods, requiring additional hours to weed and protect their plants. And the extra health boosts of chemical-free food is traditionally simply out of reach financially for so many of us. Our conversations continued over several weeks. It was important to John and Stefan that the families receiving their free CSA shares not be differentiated from any of the paying members. They would be given the same opportunities to help out with the harvests and farm chores that other members receive, a way of connecting to the land, knowing where your food is coming from, and the stress-reducing benefits of spending some time in nature. We agreed that the best way to find interested families would then be through our network of local Food Pantries. The pantry closest to Tinicum was The Lord’s Pantry in Ottsville, PA. The Director, Kathy Leidtke, was immediately impressed with the idea, as one of many hunger-relief sites in the region who have been trying to provide much better food choices, but lack the staff and time to develop relationships with local farmers. Kathy was able to identify fourteen of the families they serve who had their own transportation and expressed eagerness to be able to take advantage of the gift of fresh, local produce. And so it began. I have come to appreciate just how amazing our local family farmers are. They work tirelessly in damp cold and oppressive heat to grow great food for us, and deal with so much from Mother Nature that is unpredictable and often perilous. And they do this with enthusiasm and commitment. No farmer wants to see the fruits of his or her labor go unused or wasted. That is why all of us with Rolling Harvest Food Rescue have also been working tirelessly to connect local farmers with neighbors in need. Since 2010, we’ve been focused on partnering with local farmers, making it easy for them to share their fresh, healthy produce with the food-insecure communities in which they live. 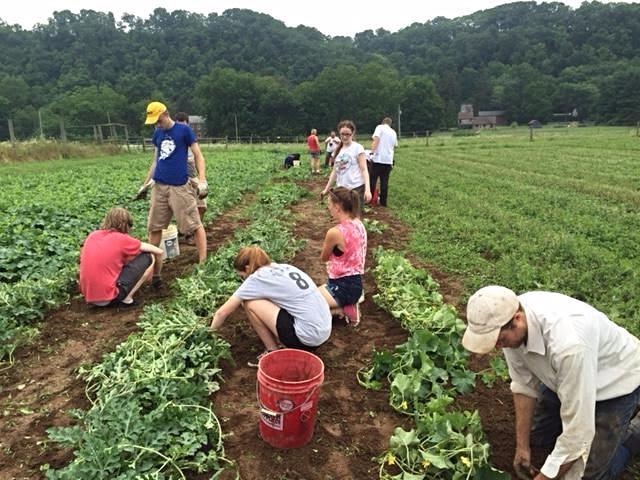 Our dedicated volunteers help with daily pick-up and delivery schedules from 35 farms and food producers, assist with weekly distributions to more than 50 hunger relief sites, and glean (harvest) directly from our farm partners’ fields. But it is the farmers who continue to do so much to be able to donate their surplus and wonderfully irregular bounty for us to share. Please support all of our local farmers and help to ensure a sustainable, local food system that benefits everyone!